"And in that day I will make Jerusalem a burdensome stone for all peoples. All who lift it shall be slashed, and all the nations of the earth will be gathered against it," Zechariah 12:3. Now let’s look carefully at the scripture… God is here taking part personally - talking about a future time (Times of the End) – a specific place; Jerusalem – and who will be involved; ALL the nations! And, those who come against Jerusalem God will personally deal with. The Bible predicted in Zechariah 8:7-8 and in Zechariah 12:3 that Jerusalem would become a "stumbling block" and this could not happen until 1967 when Jerusalem was liberated and back into Jewish hands. In Luke 21:24 we read… "Jerusalem will be trampled by the Gentiles until the times of the Gentiles have been fulfilled." The signs of this prophecy have begun to be rapidly fulfilled and falling into place since Israel became a State in 1948. Today, we are witnessing the world, including Israel’s closest ally America, raising up against Israel to force her to divide the City of God! Who does Jerusalem really belong to …? Our world is changing fast …and it can be very scary if we are not aware of what God has told us in His Word about the ‘Times of the End!’ Yeshua (Jesus) is on our side and though our ride may be bumpy it will be worth it in the end! 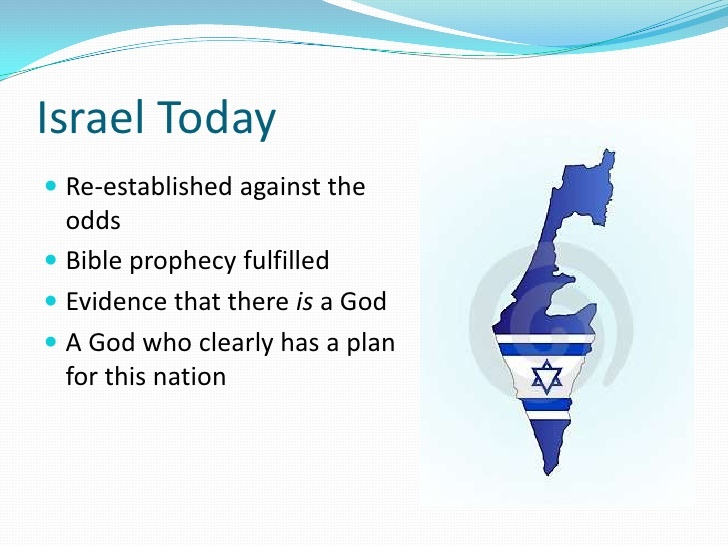 The Signs of Israel are very important in understanding where we are in Bible prophecy. Though NOBODY knows the time of our Lord’s return we have been told to watch the "seasons" as the Lord wants us to be aware of what is happening and not to be caught unaware! Every generation expectedly thought that they could be the generation … but until Israel became a nation this could not happen! Many world events are going on simultaneously and prophetic Scriptures are being fulfilled in our day … the exact Scriptures that prophets could only write about …and what Christians having been waiting for over centuries! And some prophecies that were once unthinkable may soon also be fulfilled! ISIS is approaching Bagdad and Damascus! ISIS has set their sight on Babylon …however Babylon is NOT one of the nations mentioned in the Bible that will attack Israel in the End Times. It is hard to fathom how quick ISIS has advanced over the past months and can only be doing this with the help of US President Obama who has become very hostile towards Israel …and has shown by his fruit that he is also anti-Christianity. Is it just possible that if Bagdad falls then Iraq will fade away into history…? ISIS taking Iraq will also allow quick advancement into war of Armageddon! Another watch is Syria …where ISIS is also involved. Hezbollah (Lebanon) and the Syrian army are scrambling to protect Damascus! Isaiah 17 warns us Damascus WILL be destroyed. We may be here in next months talking about these two cities now under ISIS control…? Israel is the thermometer of the world and we need to keep our eyes and hearts focused there! It’s coming into full circle … the Gospel began in Jerusalem and will end with the New Jerusalem! 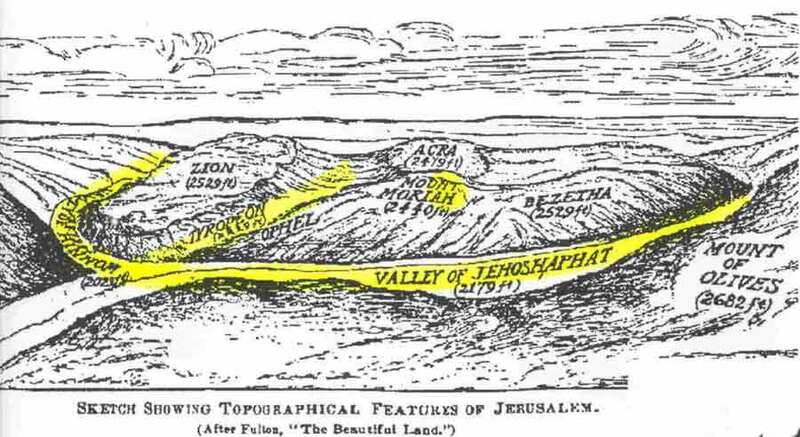 Did you know that God’s Name is written in the mountains of Jerusalem…? The Hebrew letter “Shin” which looks like a “W” is the 21st (3X7) letter …and 7th letter in the group of 7’s of the Hebrew alphabet meaning; “Shadai,” “Almighty God, the ALL Sufficient One!” The “Shin” is symbolic of the Lord’s Second Coming, the consummation of God’s Covenant and fullness of time. The “Shin” is used for the number 300 and is made up of 3 “teeth” …all of the Shin’s numbers being of divine perfection and completeness and all as a picture of “teeth” of a CROWN or the teeth of “flames of fire!” The first use of the “Shin” is in the prophecy concerning the Coming of Christ the King (Genesis 49:10-12). The first word to start with “Shin” is “Heaven,” the second word to start with a “Shin” is the word “second” and the Gematria of Shin is 360, the number of days in a FULL or complete Biblical or Hebrew Year (“Shinah”). The Scriptures will often tie a prophetic future event with something that will happen to the Jews… We are told to watch the Jews, and when a prophesied event concerning them happens, we can be sure that the other prophesied events will also occur. Yeshua (Jesus) prophesied that the Jews would be dispersed from Jerusalem and led captive among the nations… but, added that one day they would return to occupy Jerusalem, and, when that happens the End Time events will occur and will lead to His return (Luke 21:24). There are many prophecies concerning the Jewish people in the End Times, many of which began to be fulfilled in the 20th Century! But, there are four key ones: The first key is a spiritual event of their worldwide re-gathering in unbelief (Isaiah 11; 11-12). In 1900 there were only 40,000 Jews in then Palestine. By the end of World War 2 that number had risen to 800,000. On the eve of 2015, the population (Jews only) was 6,218,000 who have come from across the world …and considering the 6,000,000 Jews who died in the holocaust this can be considered a modern day miracle. The prophet Jeremiah wrote twice that when history is completed, the Jewish people will look back and conclude that their worldwide re-gathering was a greater miracle than their deliverance from Egyptian captivity (Jeremiah 16:14-15; 23:7-8). We are truly living in exciting and momentous times! The second key is the consequence of a natural event that took place on the 14th May, 1948 when the State of Israel was re-established after hundreds of years of exile (Isaiah 66:6-7). The third key is fulfilment of prophecy of the re-occupation of Jerusalem which occurred on 7th June, 1967 during the miraculous Six Day War (Zechariah 8:4-8). The fourth key in prophecy is very exciting and is one that we are witnessing today! The refocusing of world politics upon the nation of Israel (Zechariah 12:2-3) and as all the nations of the world including the United States under the Obama Administration, are coming against Israel over the issue of the control of it’s Capital – the City of Jerusalem. The Vatican has also stated that it wants the city under its control. The United Nations (UN) wants it internationalized. The European Union (EU) is demanding Jerusalem be divided between the Arabs and Jews. The Palestinian Arabs want it all! The Bible clearly teaches us that God never pours out His wrath without warning for He is a just and loving God who does not wish that any should perish (2 Peter 3:9)… that’s why He has provided so many signs to warn us that we are living on the threshold of the Tribulation! But, the question is the people seeing and will the nations listen? “For the wrath of God is revealed from Heaven against all ungodliness and unrighteousness of men, who suppress the truth in unrighteousness, because the thing which may be known of God is clearly revealed within them, for God revealed it to them,” Romans 1:18-19. One hundred years ago in 1907 there was NOT one single sign, tangible, measurable sign that even indicated we are living in the season of the Lord’s return! We know there has been an Israel up until the time of the Roman Empire and then the Romans conquered the land. The Jews had no homeland, although they were allowed to live there. They were driven from the land in two dispersions: One in 70 A.D. and the other in 135 A.D. But there was always a Jewish presence in the land. The Turks, who took over about 700 years ago and ruled the land up until about World War 1, had control. Then the land was conquered by the British. The Turks entered World War 1 on the side of Germany. 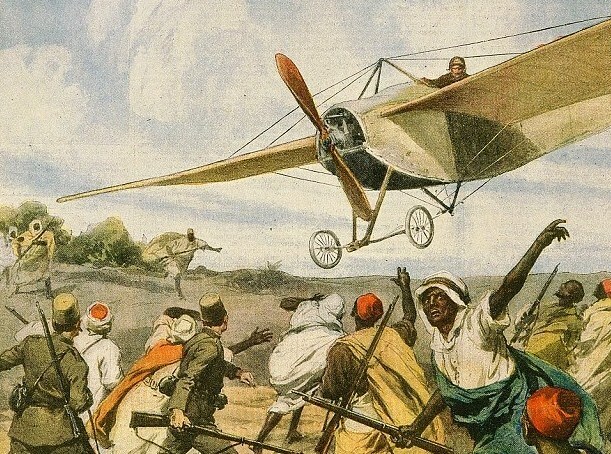 The British knew they had to do something to punish Turkey, and also to break up that empire that was going to be a part of the whole effort of Germany in World War 1. So the British sent troops against the Turks in the Holy Land. The first sign to appear was the Balfour Declaration which was issued on 2nd November, 1917… At that time Israel was NOT yet re-established back in the land as a nation and in fact nobody even thought it could happen! The Holocaust had NOT happened… Jerusalem was still in the hands of the Muslims… under Gentile rule! The Balfour Declaration was prompted by the fact that during World War 1 the Turks sided with the Germans and so then when Germany lost the war, so did the Turks …and the victorious Allies decided to divide up the German and Turkish empires. The Turkish territories, called the Ottoman Empire, contained the Ancient Homeland (Israel) of the Jewish people - an area that in the 2nd Century the Romans had re-named “Palaestina” after Israel’s arch enemy the Philistines, which later became “Palestine” after the Bar Kocha revolt in 132-135 AD, in an attempt to minimize Jewish identification with the land of Israel. The attack had originally been planned for the 8th December, but the weather was extreme and rain was almost continuous. The hills surrounding Jerusalem were covered with a mist at frequent intervals, rendering observation from the air and visual signalling almost impossible. However the troops moved into position. The night before the attack against Jerusalem to drive out the Turks, Allenby prayed that God would allow him to capture the city without doing damage to the holy places. The British government was grateful to Jewish people around the world, particularly to one Jewish chemist who helped them manufacture nitre an ingredient that was used in nitro-glycerine which was sent over from the New World. But they did not have a way of getting it to England. The German U-boats were shooting on the boats, so most of the nitre they were trying to import to make nitro-glycerine was at the bottom of the ocean. But a man named Weitzman, a Jewish chemist, discovered a way to make it from materials that existed in England. As a result, they were able to continue that supply. The British at that time said they were going to give the Jewish people a homeland. That is all written down in history. They were gratified that the Jewish people, the bankers, came through and helped finance the war. Britain was one of the greatest empires in history until it turned its back on the Jews! At the end of the 19th Century and the beginning of the 20th Century, many leaders such as William Gladstone, James Balfour, and Edmund Allenby were Godly Christians. They believed that God had risen up the British Empire to spread the Gospel and assist the Jews in having their Ancient homeland restored. Today we call them Christian Zionists. This is one of the reasons why Britain issued the Balfour Declaration in 1917, which favoured the Jewish State. Sadly, later leaders did not have this same view, when they turned their backs to the Jews in favour of Arab oil… Britain lost its empire and Israel was re-born. Is America next…? There is NO doubt that the events of 1917 was very prophetic and marked the beginning of end times because they led to the worldwide re-gathering of the Jewish people to their homeland and the re-establishment of the Jewish State. Since 1917 we have witnessed sign after sign that point to the Lord’s return! 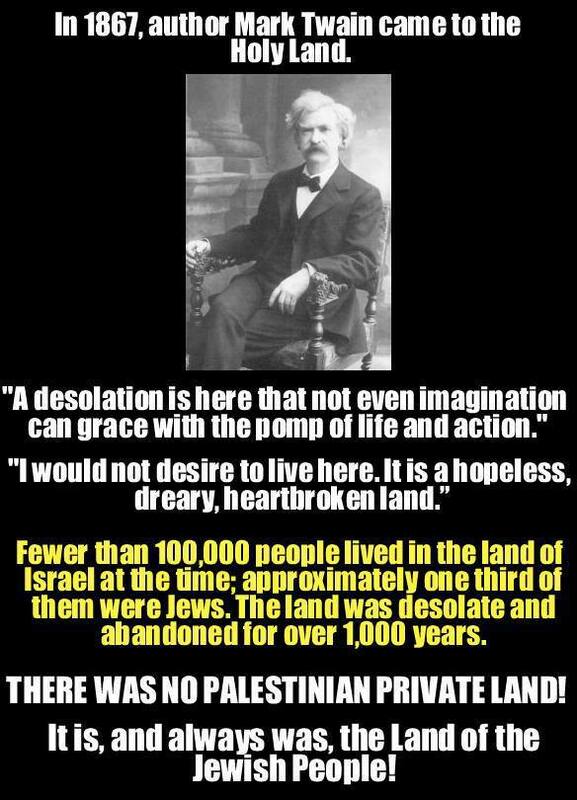 The sign that the ruins of Israel would be rebuilt… Mark Twain (Samuel Clemens) …took a tour of Palestine in 1867. This is how he described that land …We are talking about Israel now, He said: “A desolate country whose soil is rich enough but is given over wholly to weeds. A silent, mournful expanse! We never saw a human being on the whole route. There was hardly a tree or a shrub anywhere. Even the olive and the cactus, those fast friends of a worthless soil, had almost deserted the country.” In Amos 9:11, 13, the prophet said that God would restore the land of David. King David ruled Israel from about 1010 BC to about 970 BC. The land of David – Israel – was conquered and destroyed by the Babylonians, Assyrians and Romans. The land had been in ruins for almost 2,000 years. The Jews who had been scattered throughout the world began to return in large numbers (just as predicted in God’s Word that they would) during the past 100 years. Since then they have been re-building many of Israel’s ancient cities! During the past 100 years the Jews have been using advanced technology for farming and irrigation to turn the barren land into productive farmland. Today, Israel is a source of food for many countries. The sign of Israel today is a modern marvel of agriculture according to the promise of God... Israel is able to bring more food out of a desert environment than any other country in the world. The Arab nations should make Israel their friend and import technology from Israel that would allow all the Middle East, not just Israel, to become an exporter of food. Israel has un-arguable success in its agriculture. God promised in His Word that when He brought back His people the desert would bloom… (Ezekiel 36:11; Isaiah 27:6, 35:1-2, Isaiah 51:3). Where was this great Palestinian nation…? It did not exist …It was not there. There were no Palestinian people under the control of Turkey, and there was no large mass of people there because the land would not support them. This is the report that the Palestinian Royal Commission, created by the British, made. It quotes an account of the conditions on the coastal plain along the Mediterranean Sea in 1913. The Palestinian Royal Commission said; “The road leading from Gaza to the north was only a summer track, suitable for transport by camels or carts. No orange groves, orchards or vineyards were to be seen until one reached the Yavnev village. Houses were mud. Schools did not exist. The western part toward the sea was almost a desert. The villages in this area were few and thinly populated. Many villages were deserted by their inhabitants.” French author Voltaire described Palestine as; “a hopeless, dreary place.” Under the Turks the land suffered from neglect and low population and that’s a historic fact. The nation became populated by both Jews and Arabs …because the land began to prosper when Jews came back and began to reclaim it! If there had never been any archaeological evidence to support the rights of the Israelis to the territory, it is also important to recognize that other nations in the area have no longstanding claim to the country either! Did you know that Saudi Arabia was not created until 1913, Lebanon until 1920…? And, Iraq did not exist as a nation until 1932 and Syria until 1941. The borders of Jordan were established in 1946 and Kuwait in 1961. Any of these nations that would say Israel is only a recent arrival would have to deny their own rights as recent arrivals as well. They did not exist as countries as they were all under the control of the Turks. For nearly 2,500 years Israel as a nation had not really existed as a separate nation but was declared a new sovereign state by an act of the United Nations and so historically, Israel gained its independence on the 14th May, 1948. The nation was born in a day! 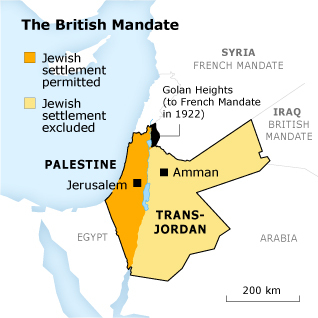 From 1920 the British ruled over Palestine, until 1948; when Israel became a State just as the Scriptures and the promise of God …the land was once again back in Jewish hands! “Who has heard a thing like this? Who has seen things like these? Will the earth be brought forth in one day? Or will a nation be born at once? For Zion travailed and also brought forth her sons,” Isaiah 66:8. Before, 1948 Israel was NOT even thought of as a nation and so the nation’s re-birth was so miraculously from God that it could be the most important sign of all. Even the Shekel as monetary currency after 2,000 Years has been re-instated just as predicted in Ezekiel 36:11, 24. 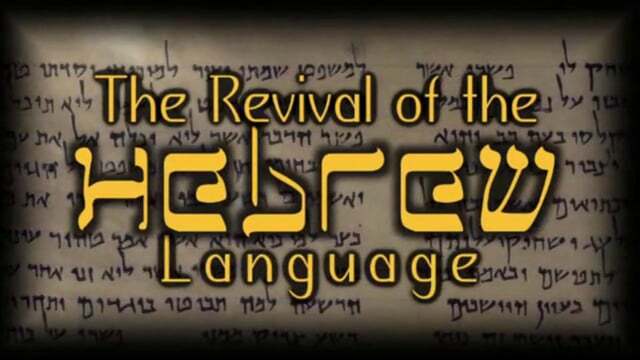 Did you know that with the return of the nation, the ancient Hebrew language has also been revived just as predicted in Zephaniah 3:8-10? Eliezer Ben-Yehuda began reviving the ancient Hebrew language on 13th October, 1881 and today it has become the official language of the State of Israel. Prior to this happening, the Jews spoke Yiddish (impure form of Hebrew) as well as the languages of their host countries. … The Sign of Israel! In Zechariah 8:7-8, the prophet said God would bring back the Jews from the east and the west to their homeland (Israel) and that they would be able to live in the City of Jerusalem again. This prophecy has been fulfilled more than once. About 2,600 years ago, Babylon destroyed Jerusalem and took many Jews as captive to Babylon. Many Jews later returned from Babylon to rebuild the city but was destroyed 1,900 years later by the Romans. The Romans killed more than 1 million Jews and forced many into exile. The Jews did not have control over Jerusalem until 1967 when the Jews re-captured the city during the six-day war! But, let’s go back once again to 50 years prior to Jerusalem being liberated from the Turks, to see the hand of God orchestrating these events so this could happen! One of the most important battles in World War One was the battle for control of the wells at Beersheba. It also turns out that this was one of the most important battles in redemptive history that would also change the course of history. You see, without wells, the British/Australian/New Zealand military would not have been able to liberate Jerusalem from the Turks. They needed water for their men and for their horses …but Beersheba was protected by thousands of German and Turkish soldiers …as well as the desert! It was tactically and humanly impossible to take Beersheba! Impossible…? Yes, that is, for everyone …BUT God and the 800 Australian Light horsemen who did it on the 31st October, 1917! We have to realize God’s sovereignty over Jerusalem and Israel! There is another divine God-story about Jerusalem…. In Ezekiel 44:1-3, God told Ezekiel that He would seal-up the Eastern Gate (also called; Golden Gate, Gate Beautiful or Gate of Mercy) until the time of Messiah who would open it and enter His City in all His power and glory. The reason that He would seal the gate is because the Lord Himself had entered the city through this gate (Ezekiel 43:4). And, no mere mortal could enter the city where the glory of God had entered! It was centuries later in 1545 AD when this prophecy was actually fulfilled by Suleiman the Magnificent, the Turkish ruler who built the present wall around the Old City and sealed up the Eastern Gate. 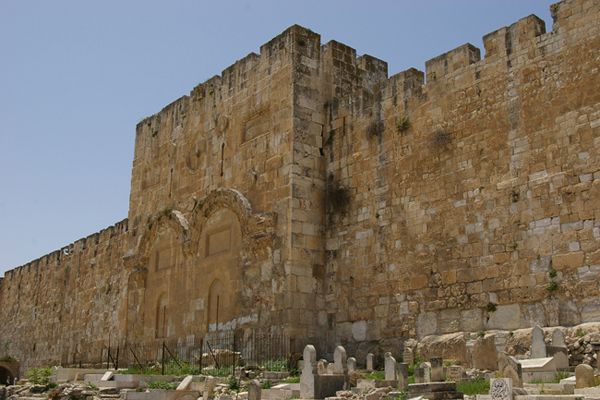 Suleiman had heard the stories about the Jewish Messiah coming to Jerusalem through the Eastern Gate. So he sealed it shut and put a Muslim cemetery in front of the gate thinking that no Jewish holy priest from the tribe of Levi would desecrate himself by walking through the cemetery. When the IDF commando group approached the Old City to fight the Jordanians, they had a difficult time getting into the city. Some of the members of the group suggested that they surprise the Jordanians by blowing up the Eastern Gate and entering through it. BUT, as God had orchestrated this event, the leader of this group was an Orthodox Jew. He told his squad the Bible Scripture of Ezekiel and that the Eastern Gate could only be opened by the Messiah. Instead of blowing up the Eastern Gate, they entered through the Lion’s Gate and captured the Old City in fulfilment of Bible prophecy. Of course the Messiah is not from the tribe of Levi but from the tribe of Judah. So no Muslim cemetery is going to bother him. When the Lord returns to Zion, He will speak the Word of God to the Eastern Gate and His voice like a thunder … will command the Eastern Gate with these words from… Psalm 24:7-8; “Lift up your heads, O gates; and be lifted up, O everlasting doors; and the King of glory shall come in. Who is this King of glory? Jehovah strong and mighty, Jehovah mighty in battle. Lift up your heads, O gates; even lift up, O everlasting doors; and the King of glory shall come in. Who is this King of glory? Jehovah of Hosts, He is the King of glory.” This sign of the Eastern Gate in Jerusalem, Israel will be fulfilled! Maranatha Lord! All the archaeological evidence supports Israel’s right to the land, and every time there is a dig in Israel, it does nothing but support the fact that Israelis have had a presence there for 3,000 years. The coins, the cities, the pottery, the culture and there are other people, groups that are there …but there is no mistaking the fact that Israelis have been present in that land for 3,000 years. It predates any claims that other peoples in the region may have. The ancient Philistines are extinct and many other ancient peoples are extinct. They do not have the unbroken line to this date that the Israelis have. Even the Egyptians of today are not racial Egyptians of 2,000 - 3,000 years ago …they are primarily an Arab people. The land is called Egypt, but they are not the same racial and ethnic stock as the old Egyptians of the ancient world. The Israelis are in fact descended from the original Israelites. The Arab world will claim they are the rightful owners of the land of Israel (Ezekiel 35:5, 10; 36:2, 5). It wasn’t until the Jews began returning back to Palestine in the hopes of declaring Israel’s Statehood that the Arab world laid a claim to the land. Before that the land had no value to them. Israel has the right to their God-given land and even though badly treated and increasingly becoming isolated by US President Obama Administration, Israel remains a loyal and strategic ally of the United States whether the US realizes it or not! Israel is the only democracy in the Middle East and has kept hostile Arab nations and terrorist groups from taking complete control of the Middle East. If it were not for Israel, they would overrun the region. It is good to know that in Israel the West has a friend in the Middle East on whom we can count on ...Israel! The greatest sign of our day is that if it had not been for Almighty God… tiny Israel could not exist in a hostile Muslim neighbourhood! “Though you search for your enemies, you will not find them. Those who war against you will be as nothing at all. For, I, am the Lord, your God, will hold your right hand, and says to you, Do not fear; I will help you. Do not be afraid, O worm Jacob, O little Israel; for I Myself will help you, declares the Lord, your Redeemer, the Holy One of Israel,” Isaiah 41:12-14. The Sign of the Third Temple rebuilt… Why would God allow this Temple to be re-built since our Lord had told us, “It is finished,” John 19:30…? He meant that He was the once and for all perfect sacrifice for sin. We as Christians know that ...BUT, the Jewish people don’t and this is a Jewish Temple. The Jewish people, after all, are the Lord’s brethren. They are in need of a great spiritual awakening and revival. The Third Temple will be a great catalyst for this spiritual awakening and like a magnet drawing the Jewish people back to Israel and back to their covenant God. 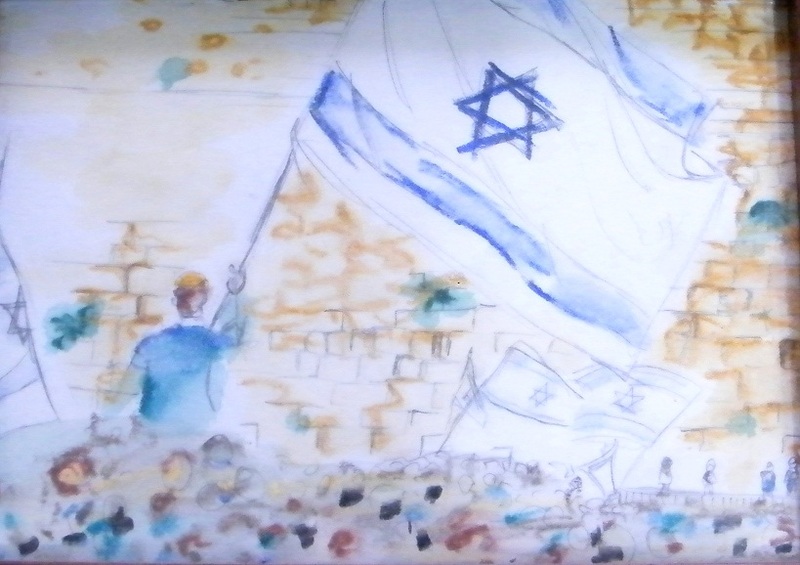 It will be a powerful picture of redemption pointing them to Yeshua (Jesus) as their Messiah …since the Jewish people connect the re-building of Jerusalem and the Temple with their coming Messiah. Christians around the world are affected by events in Israel. How? For one thing, they are looking for signs pointing to the Second Coming of Yeshua (Jesus Christ). Perhaps one of the most significant signs we as Christians can look for is the reconstruction of the Holy Temple on Mount Moriah (the Third Temple), and the re-instituting of Old Testament sacrifices. Why? This would be followed, prophetically, by the appearance of the Man of Sin (Antichrist) in the Temple to shut it all down again …to call an end to prayers and sacrifices. This is called the Abomination that makes desolate, or the Abomination of Desolation (Daniel 9:27; Matthew 24:15; 2 Thessalonians 2:2). Bible prophecies tell us that Jerusalem certainly WILL be divided… “But the court which is without the temple leave out, and measure it not; for it is given unto the Gentiles: and the holy city shall they tread under foot forty and two months,” Revelation 11:2. This verse indicates that Israel will only control the Temple location specifically, while Gentiles (i.e., Muslims under UN supervision) retain control of the rest of the Temple Mount. It further tells us that Jerusalem itself WILL be divided for three and a half years. The Bible says we cannot know the time of the Lord’s return (Matthew 25:13) …but, the Scriptures make it equally clear that we can know the season of the Lord’s return; “But of the times and the seasons, brothers, you have no need that I write to you. For you yourselves know accurately that the day of the Lord comes like a thief in the night. For when they shall say, Peace and safety! Then sudden destruction comes on them, as travail upon a woman with child. And they shall not escape. But you, brothers, are not in darkness, that the Day should overtake you like a thief,” 1 Thessalonians 5:1-4. This passage asserts that Yeshua (Jesus) is coming “like a thief in the night” …but, then it proceeds to make it clear that this will be true for pagans only, not for believers. The Lord’s return should be NO surprise for those of us who know Him and His Word, for we have the Holy Spirit dwelling inside us giving us understanding of the nature of His times! Here are the determinate prophecies that NO man NOR any devil in hell will be able to prevent… They describe the events that will occur in Jerusalem when Yeshua (Jesus Christ) returns at Armageddon to save Israel and establish His Kingdom… Joel 3:2. Today, we are witnessing increased persecution of Christians (Matthew 24:9) just as the Lord warned us! We ask ourselves, why is there a ‘deadly’ silence from the United States, EU, and Western World Leaders who claim that their countries are Christian? Just as the persecution is falling upon the Jews across the world …so is it upon Christians. Why? Because when we begin to realize that we are connected in Judeo-Christian belief. We cannot ignore the Signs of Israel because they are our signs too!